Mary M. Myers, 99, of Middle Point, passed away on Tuesday, January 29, 2019, at Van Wert Hospital. She was born on July 15, 1919, to John and Frances (Sendelbach) Volk. On June 27, 1937, she was united in marriage to Harold S. Myers who preceded her in death. Mary is survived by a son, Gary (Judy) Myers of Middle Point; 5 grandchildren, Greta Nettleton, Amy Myers, Gary Scott (Jennie) Myers, Clint (Sherry) Myers and Debra (Kevin) Potts; twelve great-grandchildren, Deanna and Graham Nettleton, Chauncey Myers, Avery Etzler, Tara, Amber and Tyler (Nicole Benson) Myers, Lacine (Matthew) Reinhart and Dancia (Joe) Balyeat, David Hiller, Travis Potts and Lydia (Eric) Monroe; seven great-great-grandchildren, Anthony Porter, Rylea Hilgert, Landon and Gavin Stant, Brennon Horton, Aubrin Myers and Zoey Greenwalt; and four step great-great-grandchildren, Jennifer, Angela, Isaiah and Eli Benson. She was preceded in death by her husband; a daughter, Deanna Myers; a sister, Bernie Pohlman; two brothers, Lawrence and Howard Volk, and her life- long friend and companion, John Yakos. Mary retired in 1997 after working as a cook at Conrad’s Truck Stop for forty years. She was also a wallpaper hanger, and a newspaper carrier for the Van Wert Times Bulletin in Middle Point. She retired from delivering papers at age 90. She was a member of Victory Church in Van Wert. 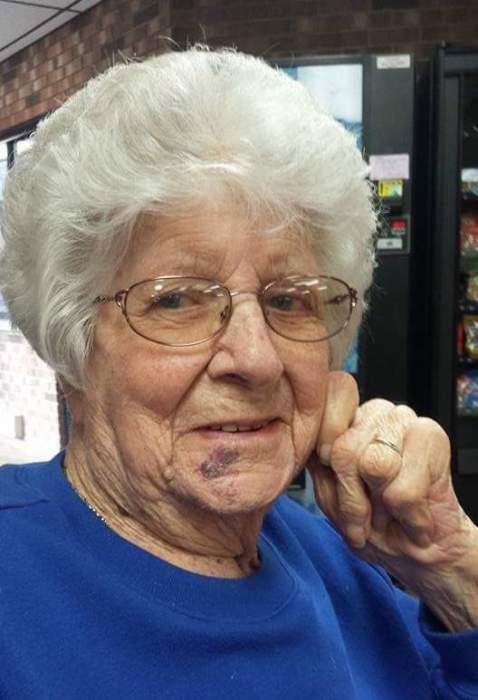 Mary loved to do crossword puzzles and was an avid collector of cow cream pitchers.